An unsymmetric distribution of the infills in plan may causc torsional response to the translational horizontal components of the seismic action. Obviously, due to the torsional component of the response, structural members on the side of the plan which has fewer infills (termed the 'flexible' side in torsionally unbalanced structures) will be subjected to larger deformation demands than those on the opposite, heavier infilled side. Analytical and experimental research59'60 has shown that the increase in lateral strength and stiffness due to the infills compensates for the uneven distribution of interstorey drift demands over the plan. In other words, the maximum member deformation demands in the presence of pianwise irregular infilling normally do not exceed (at least by much) the peak demands anywhere in plan in a similar structure without the infills. Nevertheless, as local deformation demands might exceed those estimated from an analysis that neglects the infills, EN 1998-1 requires doubling of the accidental eccentricity of Section 4.8 in the analysis of the structural system that neglects pianwise irregular infills. This does not unduly penalize either the design procedure or the structural system; it is also quite effective, especially when the structural system is almost fully symmetric and pianwise regular and its analysis without accidental eccentricity predicts a response without any torsional features. literature on mechanical models for the (masonry) infill panels, relevant guidance for the designer is given in the following paragraph. A solid infill panel can be conveniently modelled as a diagonal strut along its compressed Clause 5.9(4) diagonal. 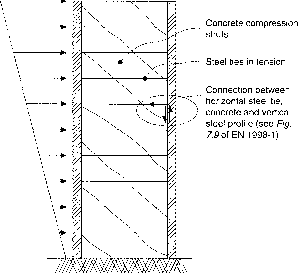 Section 5 of EN 1998-1 addressing concrete buildings alludes to application of the beam-on-elastic-foundation model61 for the estimation of the strut width. As an alternative, Section 5 of EN 1998-1 allows taking the strut width as a fixed fraction of the length of the panel diagonal. A value of the order of 15% of this diagonal is quite representative. Within the framework of linear analysis the strut may be considered as elastic, with a cross-sectional area equal to the wall thickness iw times the strut width, and modulus E that of the infill masonry. The strength of the infill - for non-linear analysis, or verification of the infill, or calculation of its local effects on the surrounding frame members - may be taken as equal to the horizontal shear strength of the panel (shear strength of bed joints times the horizontal cross-sectional area of the panel) divided by the cosine of the angle, 9, between the diagonal and the horizontal. Eurocode 8 draws the attention of the designer to the verification of structural elements Clause furthest away from the side where the infills are concentrated (the 'flexible side') for the 4.3.6.3.1(2) effects of torsional response due to the infills. For severe irregularity in plan due to concentration of stiff and strong infills along two consecutive sides of the perimeter of the building, the response due to the translational horizontal components of the seismic action is nearly torsional about the corner where these two sides meet. It turns out that in the vertical elements at or close to that corner the peak deformation and internal force demands computed for separate action of these two components on the system without the infills take place simultaneously.59'60 So, regardless of whether the infills are taken into account or not in a 3D structural model, the seismic action effects (bending moments and axial forces) due to the two horizontal components in these vertical structural elements would be better taken to occur simultaneously, instead of combined in accordance with Section 4.9.